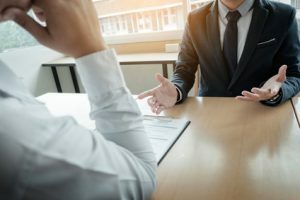 How can you prepare for a job interview well enough that you have the holy grail, a no-blank interview where you answer every question without a single blank, frozen silence? Practice and perspective! Rehearse your elevator pitch. Practice introducing yourself and mentioning the characteristics that make you a great match for the job. Research. Do some research on what the company does, and what they want from their ideal candidate for the position. Make sure you can answer questions about why you’re a great match. Presentation. Make sure your handshake and smile are interview-ready. This will give you confidence for the rest of the interview. Plan your suit, too, so you know you look the part. Again, a great confidence-builder! Reframe the question. Practice interviewing with friends or family. When you hit a difficult question, reframe it as part of the answer. This allows you to slow down and gives your brain a chance to access an appropriate answer or memory. Behavioural questions. Practice these, too, and come up with some good examples of negative and positive stories from your career that meet the demands of many of the common choices. “Tell me about a time when you failed and how you recovered” can use the same story as “Tell me about a time you received negative feedback, and what you did about it”. You’ll see similar patterns in these questions, and with some practice, you can make them work for a few stories that are easy to remember and tell…and that show you in a positive light! Perfection. It’s not about being perfect. Job interviews are about being likeable, confident in your skills and experience, and showing a good fit for the position and corporate culture. Recovering from a slight mistake or an unexpected pause (such as a coughing fit or an outside interruption such as a phone ringing) can make you look better. An employee that can accommodate the unexpected and not lose focus or drive? That’s a winner! Positive. Speak of your past employers with respect and fondness. Talk about your mistakes as learning opportunities that brought you maturity and growth. Choose the most positive route with every answer. And choose to believe the job is yours if you want it. Stay positive and confident for the best interview results. Gatekeepers, not Gods. The folks you interview with are not all-powerful beings who should inspire fear and nervousness. They are professionals who are looking for a good match, and simply gatekeepers to the next interview or step. If you keep this perspective through even the final interview, your nerves won’t overcome you and your brain is less likely to blank out!